Hairology claims to be a natural keratin hair fiber that thickens hair and conceals scalp. The unique feature about Hairology is that it comes in a “point-and-pump” applicator to evenly distribute the fibers. How does the Hairology work? Hairology claims to instantly covers the scalp and blends in the hair. Just “point and pump” the Hairology fibers for more natural, fuller and youthful looking hair. Thousands of natural keratin fibers magnetically attract to your hair, thickening and completely concealing thinning hair and scalp. Hairology claims to give you instant natural looking coverage that lasts all day as Hairology is wind and humidity resistant. The best part according to the Hairology infomercial is that it stays there until you wash it. Smart Shade – Hairology’s unique smart shade pick up your hair’s natural color and highlights for a perfect match. Hairology also claims to to cover the root of the hair in seconds. Ingredients – Gossypium herbaceum, Keratin, Hydrolyzed Oat Protein, Silicon dioxide and Laurdimonium Hydroxypropyl. The name “Hairology” consists of words “Hair” – which is the subject of the solution and “Logy” which stands for knowledge. The combination (“Hair” and “Logy”) is cleverly selected to impress upon the buyers the false notion that the product has undergone intensive research and study. Hairology marketing heavily relies upon paid reviews. The advertising video and the website TryHairology.com feature paid reviews. You cannot trust these Hairology reviews because the actors/models in the video are getting paid to promote the product. These are not actual user reviews. Having reviews in the infomercial video is an old tried and tested method of promoting products and the “As Seen On TV” industry’s main marketing technique. “Point-N-Pump” – The makers of the Hairology keratin fiber have devised high-sounding jargons to make their product look scientific. But when we analyzed the reviews of similar keratin spays we found that they don’t work. You need to consider the disadvantages while using the Hairology Spray Pump. Pump gets clogged and stuck. “Point-N-Pump”mechanism that the Hairology so boasts of is not convenient to use. It is difficult to hold and spray. You have to apply lot of pressure for the pump to spray the contents. The content of the spray are too coarse to be sprayed evenly. The quality of the spray is not good and will not last long. If the “point and spray” technique had really worked then do you think that other beauty brands that make specialized beauty products wouldn’t have exploited this idea. New Keratin Fibers – The Hairology advertising video always mention the keyword “new” – “new keratin fibers”, “new scalp concealer” and so on. But there is nothing new about the Hairology. The ingredients are nothing special. All hair fibers have the same ingredients. The “point and pump” feature is also not new, it has been tried and is confirmed that it does not work. Smart Shade – The claims made about the “Smart Shade” is another grey area of Hairology’s marketing. According to promoters of the Hairology, “the “Smart Shade” is colored with “smart pigments” that will automatically pickup the high and low range in the color spectrum of your hair shade.” Normally if there is any new technology being used in a product, then companies get it patented. We searched but haven’t found any Hairology patent. This whole explanation about “Smart Shade” is confusing and raises doubts on the claims and could be false all together. 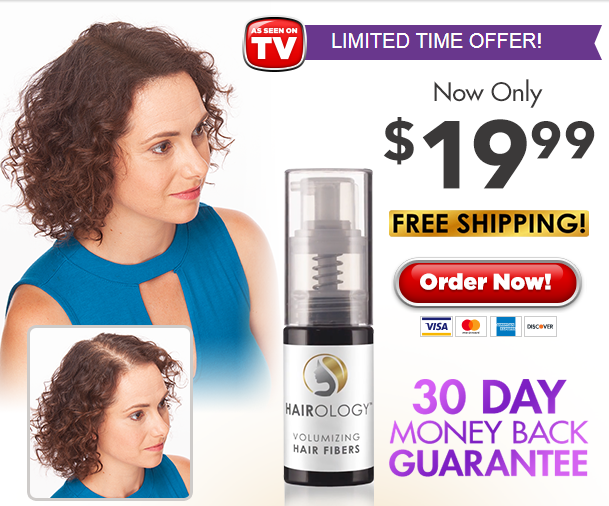 Manufacturer of Hairology – Hairology is promoted by the company named Digital Target Marketing – which is an “As Seen on TV” Company known for selling shoddy infomercial products. The company has no prior experience and expertise in making specialized quality hair products. I wouldn’t trust such a manufacturer when buying a hair product. Size of the Hairology Bottle – The Hairology bottle is tiny. The website or the video does not mention the amount of the content. It is very un-professional to hide such an important information. From the picture the Hairology bottle looks “tiny”. Non Refillable – The Hairology spray bottle cannot be re-filled. So once you exhaust the spray you have to buy a new bottle which is costly. Hairology is not the only keratin hair fiber available in the market. there are tons of tried and tested products out there. And given the fact that the coarse and viscous nature of the keratin fibers make them difficult to be sprayed evenly, defeats the purpose of Hairology. Yes we do acknowledge that applying keratin hair fiber is a tedious task but Hairology is certainly not an answer to that. We recommend XFusion Keratin Hair Fibers along with the applicator over the Hairology.